Synthetic peptide corresponding to Human HuB+HuC+HuD aa 233-244 conjugated to Keyhole Limpet Haemocyanin (KLH) (Cysteine residue). 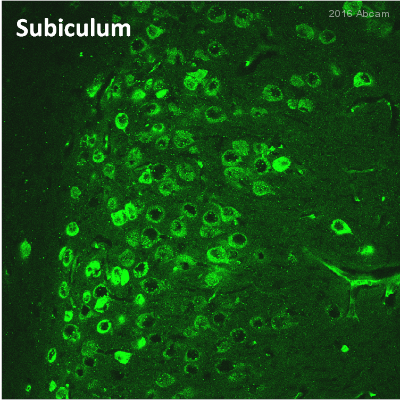 HuC Human recombinant protein fragment His-tagged; HuD Human recombinant protein; SH-SY5Y cell lysate; SH-SY5Y cells. The purity of ab176106 is near homogeneity as judged by SDS-PAGE. The antibody was produced in vitro using hybridomas grown in serum-free medium, and then concentrated by chemical fractionation. Our Abpromise guarantee covers the use of ab176106 in the following tested applications. ELISA Use a concentration of 1 µg/ml. (or use at assay dependent concentration). WB Use a concentration of 1 µg/ml. Predicted molecular weight: 40, 42 kDa. Why the observed band size is different than the predicted band size: HuC protein (ab91911) is a fragment and has an N terminal His tag and is predicted to present at 24 kDa. Immunocytochemistry with SH-SY5Y cells stained with ab176106 in red and DAPI in blue, as a counter stain. Fixation: Paraformaldehyde fixed (4%, 20 minutes). Permeabilization: Triton X-100 permeabilized (0.1%, 10 minutes). Blocking: 10% Goat Serum/PBS (1 hour). Primary: ab176106, 1 µg/ml (10% Goat Serum/PBS, 2 hours at room temperature or over night at 4°C). Secondary: Alexa 594 goat anti-mouse H+L used at a 1/1000 dilution in 1%Goat Serum/PBS for 1hour at RT. Washing: 3X 1% Goat Serum/PBS, 10 minutes per wash.
DAPI: 2 uM in 1% Goat Serum/PBS, 10 minutes. Specificity of antibody using the ELISA platform. Antibody concentration is at 1µg/mL the concentration of recombinant proteins is at 250ng/mL. 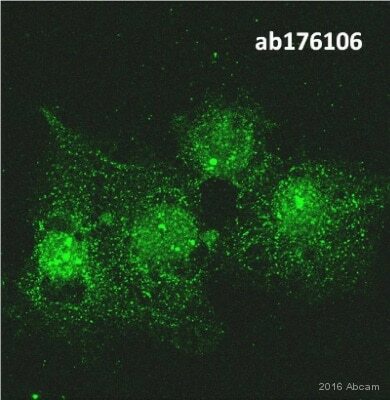 ab176106 reacts specifically to HuC/ELAVL3 and HuD/ELAVL4 proteins. Reactivity with HuB protein is predicted by the immunogen sequence similarity. ab176106 has not yet been referenced specifically in any publications. Publishing research using ab176106? Please let us know so that we can cite the reference in this datasheet.